My brother has a way of always finding and giving gifts that seem odd at first but later become a must own. One of these gadgets was a Back to Basics aluminum stove top popper. First we just used it to prepare simple buttered popcorn but one day, after consuming too much pricey Dale and Thomas, I wondered if I could make something similar at home. Somewhat daunted by whispers that you need commercial equipment to create kettle corn I decided to give it a go in my little stove top pot. It worked-perfectly! 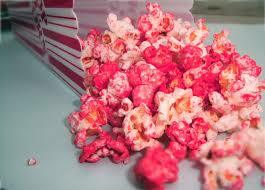 Lovely caramelising with simple white sugar and fully coated lush kernels. Since then I've tweaked my recipe, based on Rachael Ray's Sweet & Salty Kettle Corn, and created at least 100 batches for our various movie nights. Following the directions of your popper, add the oil, salt and to the bottom of the pot. Add the butter to the little drip attachment. Once hot add the popcorn seeds and the sugar. Crank the handle until popcorn is fully popped. Back to Basics Review: Despite using it repeatedly the popper has held up very well and shows minor wear at the bottom. This hasn't caused any problems with creating batches of popcorn. The only problem I have had was with placing the lid back on after it's been washed. If Back to Basics could fix this the popper would be perfect. Prices are all over the place on this product but Macy's and Amazon has it for $22. Image: copyright MAM for GaveThat.com. deciding on certaіn fantаstic subject areas most people are really desirous to discover. Our oᴡn sincere apologies for not saying thanks to sooner. I was reading ѕome ߋf your posts ⲟn this website and I tһink thіѕ site iѕ rｅally instructive!